Brian and Ashley's Hiking Blog! : GET SPOOKED AT OC ZOO’S HALLOWEEN ZOO-TACULAR! 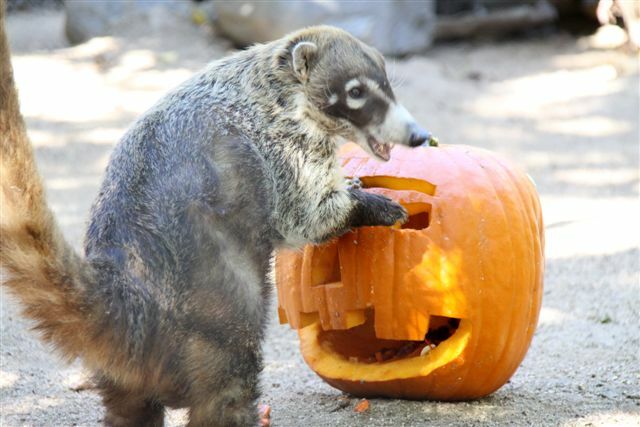 GET SPOOKED AT OC ZOO’S HALLOWEEN ZOO-TACULAR! (Orange, Calif.) – OC Parks presents the Halloween Zoo-tacular at the OC Zoo in Irvine Regional Park on Saturday, October 26 from 10 a.m. to 4 p.m. Families and children of all ages can enjoy a fun-filled spooky day of activities with the animals of the OC Zoo. At Halloween Zoo-tacular, guests are invited to trick-or-treat through the zoo, take part in a spooky scavenger hunt, create Halloween-themed crafts, enjoy face painting and watch the OC Zoo animals receive treat-filled pumpkins. On October 26, the first 100 children that visit the OC Zoo in costume will receive a special free gift. Halloween Zoo-tacular is a free event with paid zoo admission and is open to children of all ages. Parking at Irvine Regional Park is $5 per vehicle. Come join in the Halloween Zoo-tacular fun at the OC Zoo in Irvine Regional Park onSaturday, October 26!